I love being nosy and seeing what other people keep in their bathrooms so I decided it was about time I wrote my own post. This isn’t a highlight reel, this is literally every single product that I’ve got stashed away — everyday things, occasional things, and products I just can’t be bothered to clear away. I don’t think there’s anything wrong with posting an edited version of what you use — hell, I do it myself — but we’re all guilty of hoarding and I thought it’d be fun to see how much I’d accumulated since I moved here last September. Yes To have become one of my favourite cruelty-free high street brands — you get a lot of product for your money and their products are sold in most Boots stores, so they’re easy to find. Yes To Coconut Ultra Moisture Conditioner, £5.99, smells absolutely gorgeous, first and foremost, and it also really nourishes the hair without weighing it down, which is important when your ends are fine like mine. I’ve used it every other day for I don’t know how many months now and I’m only just running out, so I can’t recommend this stuff enough. 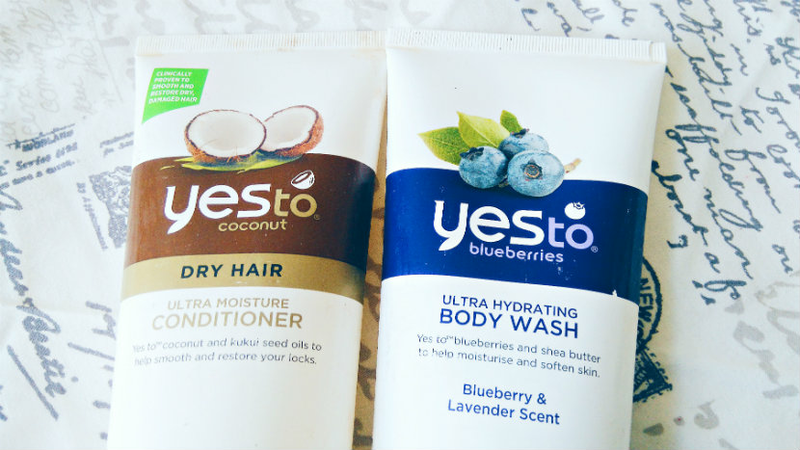 I normally shower in the morning but if it’s later on in the day I’ll use the Yes To Blueberries Ultra Hydrating Body Wash, £4.99, which contains lavender but doesn’t contain sulphates and is therefore very gentle on the skin. Of course, I couldn’t just stop with one shower gel. Soap & Glory Rich & Foamous Body Wash, £6.50, tends to be my go-to in the mornings — it has the same warm, sugary, waffle scent as The Breakfast Scrub – but I also like a little bit of LUSH Snow Fairy when I need a pick-me-up (another uber-sweet scent, although this one is more like candyfloss). When it comes to shampoo I tend to use it every other day and alternate between two: Green People Daily Aloe Shampoo, £12, and Maple Holistics Winter Blend Shampoo. I adore the scent of the Maple Holistics shampoo, which contains five different types of mint, but I think my hair has got used to it because lately it hasn’t been keeping my hair clean for very long. The Green People shampoo perhaps leaves hair less silky but it does give a nice, clean, swishy feel and its effects last longer, so I’m leaning towards that at the moment. I’ll be honest, I never use this Neal’s Yard Remedies Rosemary and Cedarwood Hair Treatment (v), £6.50, and I should probably pass it on to someone who would. The thing with it is, yes, it does work, but it takes an absolute age to wash out of the hair and even then you’re still left with residue on occasions, no matter how much time you spend rinsing. The Lee Stafford Coco Loco Coconut Mask, £6.99, on the other hand, is a dream to use, rinsing out with minimal fuss, and much like the Yes To conditioner it hydrates the hair and smells incredible. Body lotion-wise, I tend to grab either LUSH Dream Cream (v), £6.25, or Superdrug Vitamin E Body Cream (v) [just seen]. Both are lovely; the Superdrug cream is thicker in texture but I’d say Dream Cream is more soothing if your skin is having a bit of a nightmare. On to skincare! 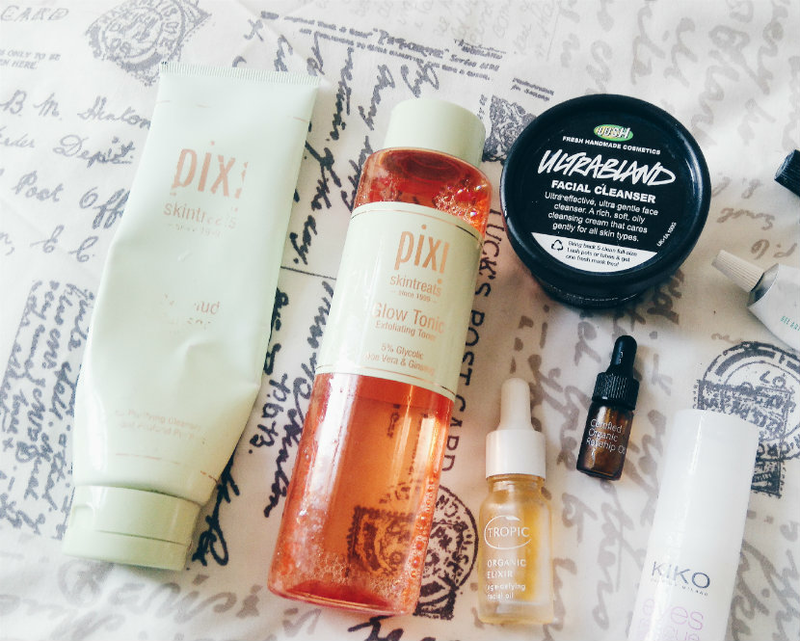 Pixi Glow Mud Cleanser, £18, and Pixi Glow Tonic, £18, are a wonderful combination, smoothing skin and leaving it brighter (the hype is all-too real with these). 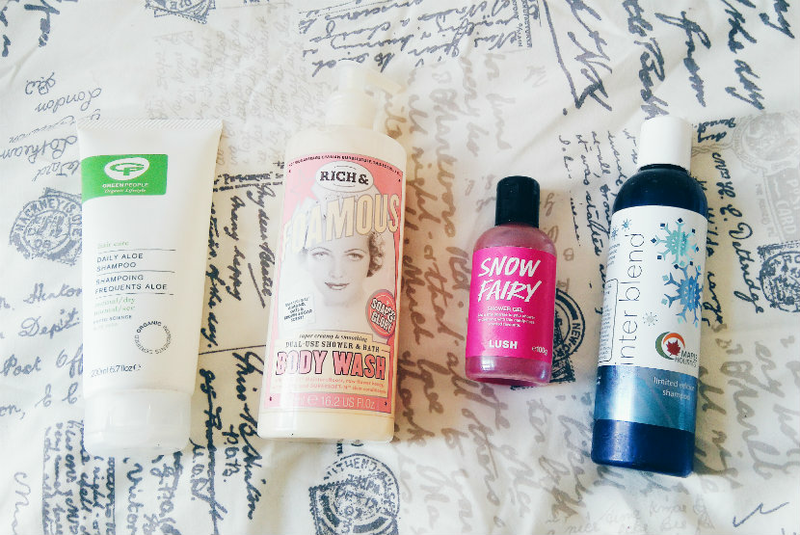 I couldn’t not mention LUSH Ultrabland, £7.50, my all-time favourite cleanser and make-up remover of choice. It has a thick, oily texture and breaks down all make-up with ease — mascara, liner, lip stain, you name it. I always like to use an oil in the evening, and I’m currently reaching for this cute little sample of the Trilogy Certified Organic Rosehip Oil (v), £12.50. Rosehip oil just really agrees with my skin, leaving it soft, hydrated, and calm without making any blemishes worse. The Tropic Organic Elixir* (v), £30, is a mixture of oils, including rosehip, and has the same effect on my skin, although I’d say my skin is less dry in the morning when I’ve used the Trilogy oil. What do you keep in your bathroom? Are you a hoarder like me? Let me know in the comments!